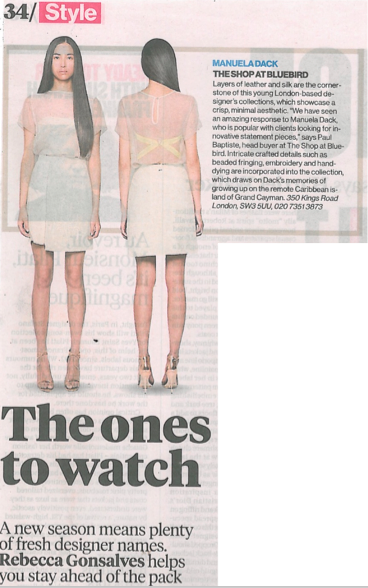 Manuela Dack, who is currently showing with Vauxhall Fashion Scout at our Paris Showroom has been featured in the UK's The Independent Newspaper as 'One To Watch' for the new season. Having had her A/W12 collection very well received at Paris, Manuela has shown with Vauxhall Fashion Scout for three season's. The home of new talent, Vauxhall Fashion Scout, has brought 23 emerging designers fresh from London Fashion Week to Paris, and for one last day they will be in under one roof, in the heart of the Marais at 18 Rue Des Quatre Fils, 75003, Paris. With the showroom closing at 5pm this evening, if you want to see the best in new talent in the fashion industry first-hand, make sure you stop by. For more information on Manuela, Vauxhall Fashion Scout and our other fantastic designers from both London and Paris, just click here.